Sha Na Na is a rock and roll revival act. Announcing themselves as "from the streets of New York," and outfitted in gold lamé, leather jackets, and pompadour hairdos, Sha Na Na performed a song and dance repertoire of classic fifties rock' n' roll, simultaneously reviving and sending up the music and 1950s New York street culture. Their current touring group features original members Donny York, and Jocko Marcellino, and another member from the TV show who had joined just after Woodstock, Screamin' Scott Simon. Everyone else from the TV show has left the group, and been replaced by bass singer Reggie Battise, bass player Jim Waldbillig, guitarist Gene Jaramillo, drummer Paul Kimbarow, and sax player Michael Brown. The group began singing as part of the longstanding Columbia University a cappella group The Kingsmen, but changed their name due to the Pacific Northwest group of the same name, famous for covering "Louie, Louie".Conceived by George Leonard, then a graduate student in Humanities, Sha Na Na began performing in 1969, at the height of the hippie counterculture, and achieved national fame after playing at the Woodstock Festival , where they preceded Jimi Hendrix. Their 90-second appearance in the Woodstock film brought the group national attention and helped spark a 1950s nostalgia craze, inspiring similar groups both in North America and in the United Kingdom , as well as the Broadway musical Grease and the TV show, Happy Days. The degree to which their act was truly nostalgic, as opposed to the degree to which it was "invented nostalgia", has, however, been called into question. The group appeared in the movie Grease as Johnny Casino & The Gamblers. The group was also successful with its own hit syndicated television show Sha Na Na from 1977 to 1982, featuring guests such as James Brown, the popular 1970s punk rock band the Ramones and musicians from rock & roll's golden era, such as Little Richard, Bo Diddley and Chubby Checker. The original band line-up featured 12 performers: Alan Cooper (bass vocals), Rob Leonard (vocals), Frederick 'Denny' Greene (vocals), Henry Gross (guitar), John 'Jocko' Marcellino (drums), Joe Witkin (piano), Scott Powell aka Captain Outrageous aka Tony Santini (vocals), Donald 'Donny' York (vocals), Elliot Cahn aka 'Gino', (rhythm guitar), Rich Joffe (vocals), Dave Garrett (vocals) and Bruce 'Bruno' Clarke. The initial act saw three "up front" dancers/singers in gold lamé and the other nine in "greaser attire" (rolled up t-shirt sleeves, leather jackets, tank tops, etc.) The group would taunt the audience and announce, "We've got just one thing to say to you f----ng hippies, and that is that rock and roll is here to stay!". The act usually ended after several encores, and closed with "Lovers Never Say Goodbye". The closing song was changed to, "Goodnight Sweetheart" for the TV series. In concert, they would often return for up to seven encores - but none more meaningful than when performing in Toronto, Canada at Ontario Place and performing "Hound Dog" after announcing the King's (Elvis Presley's) death earlier that same day. Vinnie Taylor (1949 - 1974) (real name Chris Donald), who replaced Henry Gross as the lead guitarist in 1970, died from a heroin overdose on April 17 1974, after a concert at University Hall at the University of Virginia . He was found in a Holiday Inn hotel room in Charlottesville, Virginia . Founding member of the band Robert Leonard is a professor of linguistics at Hofstra University , and had an appearance as a qualified expert in linguistics for the murder case of Charlene Hummert in the episode "A Tight Leash" of the TV medical detectives series Forensic Files in 2004. Long time member Jon "Bowzer" Bauman replaced Alan Cooper and became a recognizable member of the group as he taunted audiences while he flexed his muscles, burped and spat in the direction of the bass player. Today, Bowzer continues to tour under his own banner. Joe Witkin left the band in 1970 to finish medical school, and subsequently moved to San Diego in 1975 to do his internship and residency at the University of California in San Diego . He worked at Scripps Hospital East County from 1978 to 2000 as an ER physician, and currently holds the same position at Sharp Grossmont Hospital in La Mesa. Scott Powell today is a specialist in orthopedic surgery and sports medicine. He performed on the TV show under the stage name "Santini" (which he changed from his previous alias, "Captain Outrageous"). Powell left the band in 1980 and returned to Columbia to take pre-medical courses. He is a member of the medical staff of U.S. national soccer teams, and is the team physician for the Federation Women’s National Team and an associate clinical professor at USC . While Powell was with Sha Na Na, he sang the bulk of the Elvis revival songs. Frederick "Denny" Greene left the group to pursue studies in law. After graduating from Yale Law School, he became the vice president of production and features at Columbia Pictures. He is currently a professor at the University of Dayton . Greene was known for his skilled dancing, and sang the lead in "Tears on My Pillow", "Duke of Earl" and others. Sha Na Na hosted the Sha Na Na syndicated variety series that ran from 1977 to 1981. It was among the most watched programs in syndication during its run. The show was produced by Pierre Cossette and originally distributed by LBS Communications. The show featured the group performing hits from the 1950s and 1960s, along with comedy skits. The "tough guys" road act from their original road shows was adapted for TV and the group moved to a comedy and self deprecating routine. The mainstay continued to be the '50s song and dance routines. The show opened in a typical "concert scene," and then moved through various street and ice cream parlor scenes where they and their guests performed several songs. That was followed by a comedy-oriented song (e.g. "Alley Oop", "Hello Muddah, Hello Faddah") and closed with a slow song, again in their "concert format". Among the supporting members featured in the series were Avery Schreiber, Kenneth Mars and Phillp Roth (All of them in the first season); Pamela Myers and actress Jane Dulo (who played the crabby Lady in the Window, who watched over the street scenes from the window of her apartment with undisguised disdain) (Both throughout the show's run), June Gable and Soupy Sales (Seasons 2 to 4); Michael Sklar (Season 2); and Karen Hartman (Season 4). 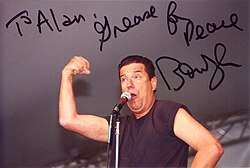 The members of Sha Na Na during the TV series were: Jon 'Bowzer' Bauman (vocals), Lennie Baker (sax), Johnny Contardo (vocals), Frederick 'Dennis' Greene (vocals), 'Dirty Dan' McBride (guitar) (left after third season), John 'Jocko' Marcellino (drums), Dave 'Chico' Ryan (bass), 'Screamin' Scott Simon' (piano), Scott 'Santini' Powell (vocals), Donald 'Donny' York (vocals). Each was introduced only by his nickname or his first name in a voice-over by Myers at the beginning of each show. Sha Na Na appeared in Grease, the movie, as Johnny Casino and the Gamblers. The group remains well-known for their tracks on the Grease soundtrack, including "Those Magic Changes", "Hound Dog", "Rock & Roll Is Here to Stay", "Blue Moon", "Born to Hand-Jive" and "Tears on My Pillow". Sha Na Na's performance in Grease was during the school dance scene. In addition to performing as a group in the movie, the song "Sandy", sung by John Travolta, was co-written by Screamin' Scott Simon. The group also appeared as themselves in the documentary Woodstock movie and the more recent Festival Express. Jon "Bowzer" Bauman, April 2000. "The Nifty Fifties", Life Magazine, June 16, 1972 (stating Sha Na Na "more or less set off the '50s kick"). The Complete Directory of Prime Time Network and Cable TV Shows, 8th Edition - 2003, Ballantine Books.